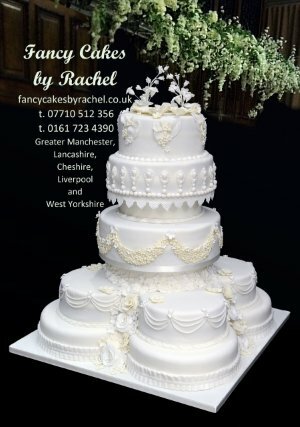 Fancy cakes by Rachel offer a range of cakes for dietary needs. We can make your cake gluten and wheat free in any flavour. We don't just replace the flour but adapt the recipes to ensure your cake is just as moist and flavoursome as a cake made with wheat flour. Our egg-free and vegan recipes are delicious. The vegan chocolate cake we make is a favourite with our vegan customers. If your requirement is dairy free we replace the butter with a quality substitute. Whatever your dietary requirements please ask and we will let you know if we can do it for you. All cakes are prepared in a environment where nuts, wheat flour, dairy products and eggs are used and therefore cannot guarantee nut, gluten, dairy and egg free.